Calling all philanthropists, good Samaritans and community activists: Colorado Gives Day is set for Dec. 6 — Tuesday. The statewide initiative, a program of the Community First Foundation and corporate partner FirstBank, comes just in time for the holiday season of charitable giving. On Tuesday, Coloradans are encouraged to make donations via ColoradoGives.org, where they can choose to make a monetary gift to a longtime favorite nonprofit organization or discover new ones that suit their passions. With a goal of helping locals “celebrate and increase philanthropy in Colorado through online giving” according to its mission, Colorado Gives Day is now in its seventh year. Its website features more than 2,000 nonprofits and foundations from around the state, including dozens based in our region, which can be searched by ZIP code or cause. Participating area nonprofits have ramped up promotional efforts over the past week in hopes of generating awareness and increasing donations. Loving noted that the value of donations made via ColoradoGives.org on Dec. 6 are increased proportionally thanks to the initiative’s $1 million Incentive Fund, one of the largest in the nation. 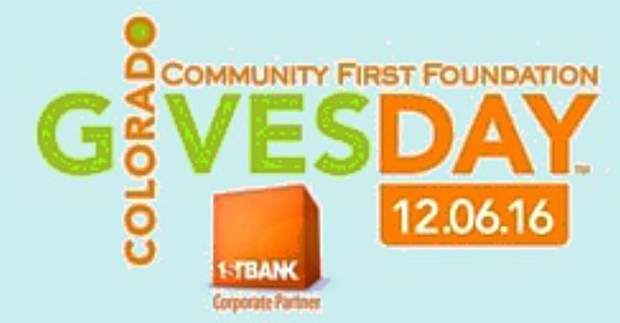 Although Colorado Gives Day has become popular in Denver and other cities along the Front Range, many valley organizations felt the need for greater awareness amongst residents in Garfield and Pitkin counties. Mountain West Gives, one of six designated regional champions within the Colorado Gives program, is a new initiative of the Aspen Community Foundation. “This has been formed out of an interest in creating a more localized effort of participation in Colorado Gives Day — and we are spearheading the movement from Aspen to Parachute,” said Aspen Community Foundation donor relations director Alicia Schuller, who has been working closely with Mountain West Gives’ 46 member organizations to help them make the most of the upcoming day of philanthropy. Downvalley members include LIFT-UP, the CMC Foundation, Colorado Animal Rescue, Riverbridge Regional Center, the Third Street Center, YouthZone and a broad range of other groups. “Although we have helped them combine efforts, our members are the ones who are truly making this happen. They have formed steering, marketing, volunteer and sponsorship committees, and they will be helping spread the word on Dec. 6 in several of our communities,” Schuller noted. Schuller also mentioned that Mountain West Gives hopes to expand its member base, and invites additional nonprofits to reach out for partnership. Whether your passion is animal welfare, education, the arts, health or any cause in between, Colorado Gives Day provides an opportunity to support exactly what you care about seeing more of in the community. Donations can be made on Tuesday or scheduled early now.